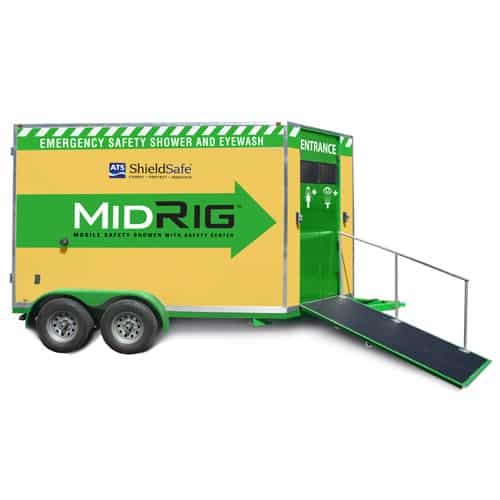 The MidRig™ is a self contained mobile safety shower and eyewash which can also double as a safety trailer with an optional heating/cooling station as well as a ANSI first aid station. The MidRig provides accident victims with much needed privacy and protection in remote, harsh enviroment locations. 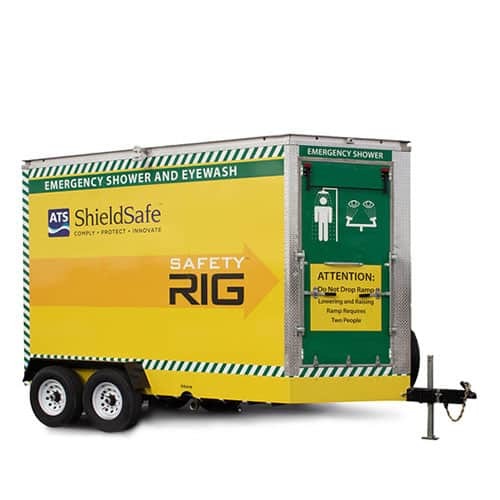 ShieldSafe has filled the growing demand for smaller, fully-enclosed mobile showers. ShieldSafe’s new MidRig shower is ANSI Z358.1 compliant and can be upgraded to meet C1D2 requirements. The MidRig protects accident victims from harsh external weather conditions inside a safe, enclosed, (optional heated/cooled) mobile shelter. The MidRig’s protective safety center is uniquely designed to protect accident victims from harsh environmental conditions and can provide additional on-site security by adding an ANSI compliant first aid kit. Its unique self-contained design eliminates the need for ANSI-required weekly activation tests. Instead, all that is required is a simple weekly visual verification of water level. This model includes a 450-gallon tank with an immersion heater to maintain the water temperature above the ANSI minimum of 60°F (15.6°C). Water pressure is provided by an electric or pneumatic water pump, and the unit comes with an integrated eyewash. MidRig’s drop-and-lock legs provide additional stability during use. A key feature of this product is its small footprint, which allows for deployment in small or tight work areas. Features You Need. Options You'll Want. See the features and available options for the MidRig. Don't just believe us—read what our customers are saying. "Thank you guys for the best customer service. It’s GREAT to see a company take pride in that department."